* UPDATE autumn 2016: The hotel has opened. 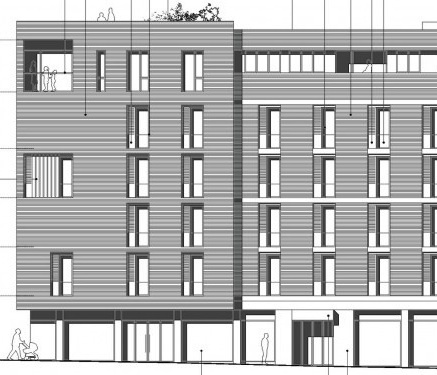 PLANS to build a six-floor luxury hotel on the empty site at 25-27 Dalston Lane E8 3DF have been amended to a three-star hotel and have won permission from Hackney council. The Premier Inn will have 90 bedrooms and at ground level a restaurant and bar. The site is owned by Davies Street (Dalston), a company that, despite the name, is located in West Yorkshire. Premier is one of western Europe’s biggest chains, providing three-star accommodation. Fierce competition with Travelodge has helped it to grow by offering special low-rate deals. It is popular for one-night stay travellers. The area, mouldering since the 1970s because of council indecision over the Georgian buildings in the area, the closure of the railway to Liverpool Street in 1986 and lately by the slowness of banks to lend to developers, is starting to come to life. Street Feast set up near the hotel site in Hartwell Street E8 3DU this summer, a gastro pub calling itself Farr’s School of Dancing is to open and opposite is the pleasant To the Jungle coffee bar. Fashionable events are held at the popular Eastern Curve Garden near the mural and the CLR James Library opposite and Dalston Junction station have added activity to the street. Jacqui Labb, of the architectural firm Dexter Moren Associates (DMA), told Loving Dalston: “The building features brick facades, with dark-grey and light-grey brick types intended to articulate the two buildings. I think it is a great place for a Premier Inn… not too far from the city. Don’t get me wrong… I think Premier Inn is a great brand. But since when did it become a luxury hotel chain? You tell me; ie, not in this article. Anyway, Ive made a slight amendment to make the Premier rating clearer. — Ed. I would hardly call a Premier Inn a luxury hotel! I was trying to say that the plans are similar to those for the formerly proposed de luxe hotel — the intro says that plans “to build a six-floor luxury hotel… have been amended to a three-star hotel”. — Ed.